For those who aren’t familiar with overclocking, it is a process through which one can get more power out of their computer hardware by tweaking the parameters it operates under. That being said, there is good news for those that like to overclock their gear: The latest offering from Intel, the Kaby Lake 7th generation processing units, have an outstanding potential for overclocking. With that potential, you won’t have to wait any longer for something to come along as something is already here. When it comes to overclocking, you can count on the likes of ASUS and ROG TO bring out true power enhancing solutions. Some may require the user to have more knowledge about the overclocking process, but this overclocking process will not require any kind of prior exposure to OC. According to ASUS engineers, it only takes a couple of moments to open BIOS and tweak it so that it will allow you to operate on 5 GHz Yup, you read that correctly: There is a 5GHz potential in the new Kaby Lake processors which ASUS has uncovered and also unlocked. To achieve this feat, you will need the latest Kaby Lake Z270 processor and a compatible motherboard like the Z270 motherboard from either ASUS or ROG. Once this is done, you can proceed to access the Extreme Tweaker\ Overclocking Presets. 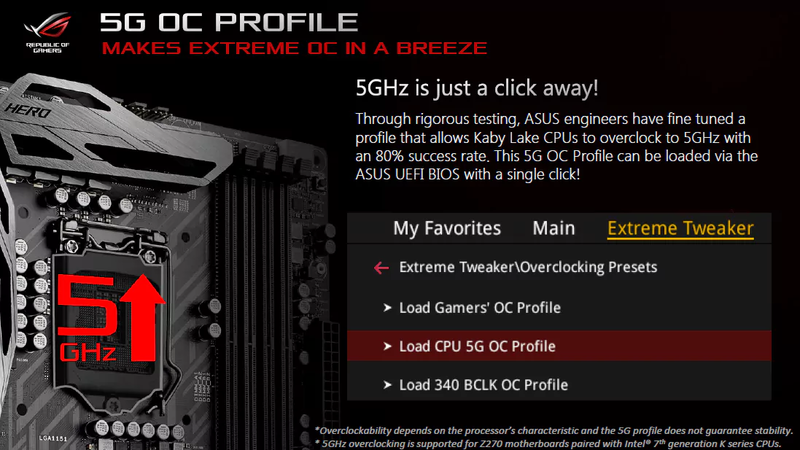 Here is where you will find an option to go into overdrive and load an OC profile that will boost you to 5 GHz. It is said that there is an 80% chance of success as far as the actual OC goes.